If you’re looking for a show stopping dessert, this is it! A Caramel Apple Cheesecake is the BEST cheesecake recipe for fall, filled with caramel and apples and a Nilla Wafer Crust! I don’t have very many cheesecake recipes on my site, and every time I make one I tell myself I need to make more. 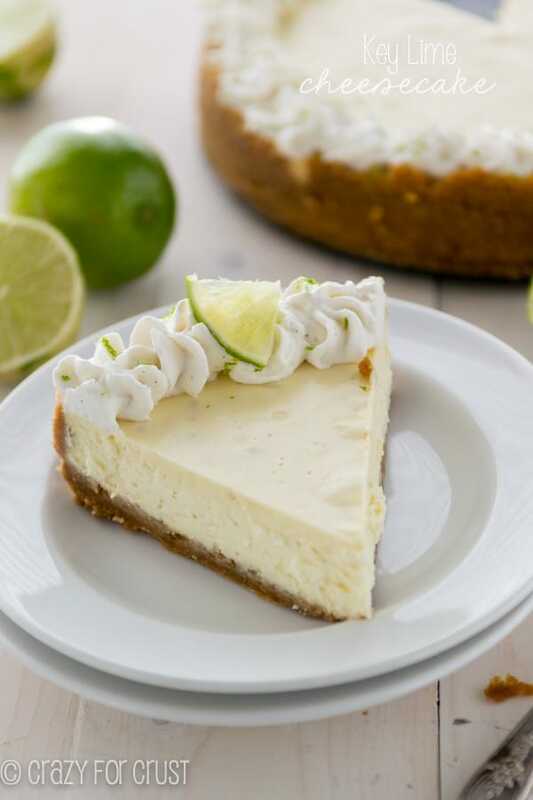 I absolutely LOVE cheesecake – it’s one of my favorites – but I always shy away from making them because they’re more involved than a normal recipe. But you know what? Sometimes more involved is worth it, like for this recipe. I mean, sometimes things that you have to spend more time working on are just better anyway, right? Because it’s a labor of love? It’s kind of like blogging friendships (whoa, great segue, am I right?). We don’t live near each other, we hardly ever get to talk in person or give each other hugs, and we have to build our friendships over social media, texting, and messenger. It’s harder to form a connection with each other, but we work hard at it because those relationships are totally worth it. Why am I comparing blogging friendship to this cheesecake recipe? Probably because it’s one of those blogging relationships I’ve created that led to this recipe. Another one of my very best blogging friends has published a cookbook all about cakes, including cheesecake. Yeah, you’re going to want to add this book to your Christmas list ASAP. Do you all know Lindsay from Life, Love & Sugar? I kind of feel like I’ve known her a long time. I remember when she was newer to blogging and she would comment here and I would go to her site and be BLOWN AWAY by her recipes and photography. (She turned me onto my love of cookie cakes!) 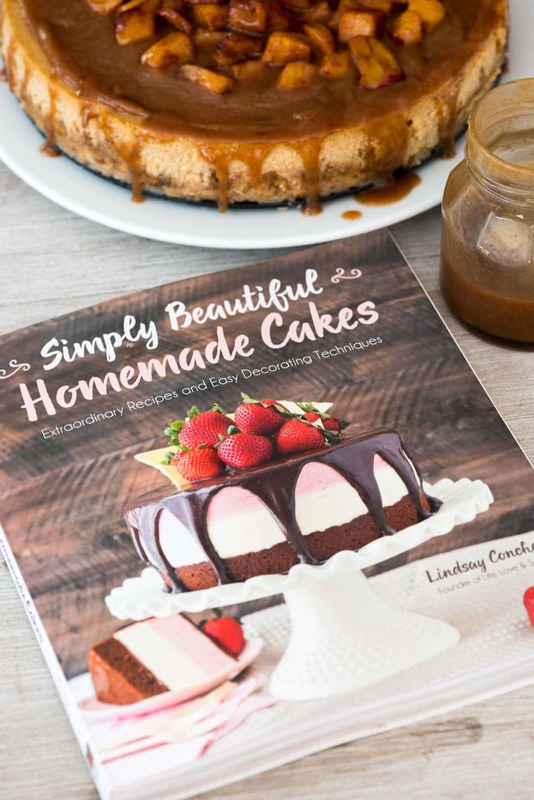 I’m so happy for Lindsay because her first cookbook is available this week! Simply Beautiful Homemade Cakes is full of some of the most beautiful cakes I’ve ever seen. Every kind of cake you can think of is included in this book, from cupcakes to layer cakes, poke cakes to ice cream cakes and cheesecakes. The flavors run the gamut from Tiramisu Cake to Butter Pecan Ice Cream Cake and that beauty on the cover, Neapolitan Mousse Cake. Plus, she has full photo tutorials on the basics of cake making, everything from greasing your pans to creating a water bath for cheesecakes and how to fill cakes perfectly. Pretty much, if you’re a cake lover, this book is one you MUST have. This Caramel Apple Cheesecake is no exception – and it tastes even better than it looks. The cheesecake starts with a Nilla Wafer crust. If you’ve never made a crust out of Nilla Wafers, you must. 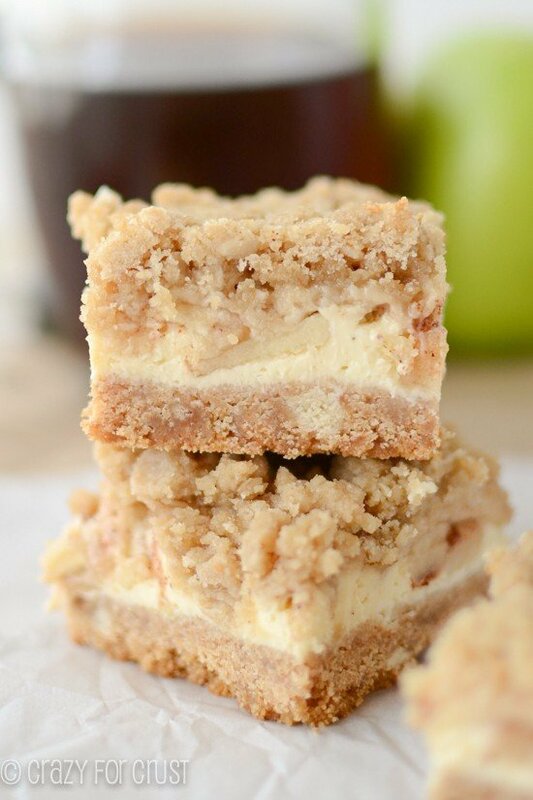 It’s the perfect complement with apple (like in my cheesecake apple bars). The crust is easy, with butter, brown sugar, and crushed cookies. Then comes the cheesecake itself: a spectacular mixture of cream cheese, brown sugar, and all the other things that make cheesecake perfection. There are even applesauce and caramel IN the cheesecake mixture! One of the things I love about Lindsay’s book is how in depth she is. She talks about making sure to beat the cheesecake on low speed so too much air isn’t added to the batter. That can cause your cheesecake to crack, which I’ve always had problems with but never knew. (This one did NOT crack – because I followed her tutorial!) She also goes in depth on how to prepare a springform pan and how to prepare a water bath. There are photos for every step! Once you bake the cheesecake and let it sit, then chill it (this takes time, so be sure to be prepared for that), you top it with the BEST topping: caramel sauce and apples. Lindsay provides a caramel sauce recipe, but you can also use a store-bought caramel. I used that inside my cake and I used my own caramel recipe for the topping. 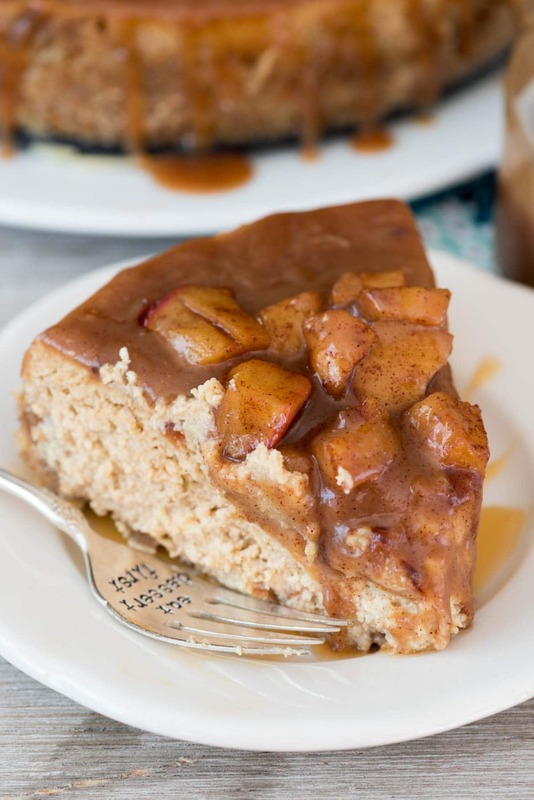 The apples are cooked in brown sugar and cinnamon so they have the perfect soft sweet flavor and make the cake just gorgeous to look at. I’m counting this as one of the best cheesecakes I’ve ever eaten – and that includes from The Cheesecake Factory. Homemade, including all the steps, is totally worth it. Plus, it would be a gorgeous addition to a holiday table, wouldn’t it? 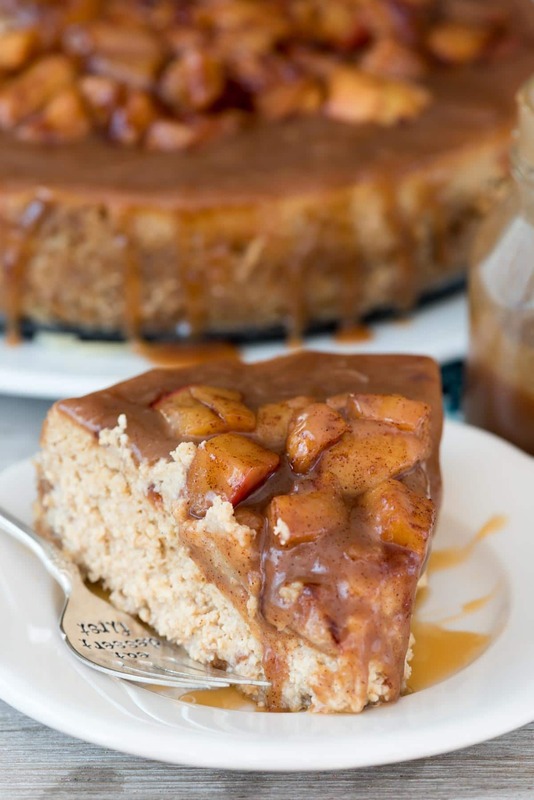 This Caramel Apple Cheesecake is the BEST cheesecake recipe for fall, filled with caramel and apples and a Nilla Wafer Crust! Preheat oven to 325°F. Grease the sides and bottom of a 9-inch springform pan with nonstick cooking spray. (You can also line the bottom of the pan with parchment paper, if you wish.) Wrap the bottom of the pan in two sheets of heavy duty aluminum foil so that when you bake your cheesecake in a water bath it won't leak. Combine the cookie crumbs, butter, and brown sugar in a medium sized bowl and stir with a fork to combine. Press into the bottom and up the sides of the pan. Bake for 10 minutes, then set aside to cool while you prepare the cheesecake. Lower oven temperature to 300°F. Beat cream cheese, brown sugar, flour, and cinnamon on low speed using a hand or a stand mixer until smooth. It's important that all your ingredients are room temperature to avoid lumps. Make sure to use low speed while beating to avoid adding excess air, which will cause the cheesecake to crack. Scrape down the sides of the bowl and mix in the sour cream, applesauce, and caramel sauce until well combined. Add the eggs one at a time, mixing slowly to combine. Scrape down the sides of the bowl as needed to make sure everything is mixed. Pour the cheesecake filling into the crust. Place the cheesecake pan in a larger roasting pan. Place the pan in the oven and then fill the pan with enough warm water to go about halfway up the side of the springform pan. The water should not go above the top of the foil. Bake the cheesecake for 1 hour and 25 minutes. Turn off the oven and leave the cheesecake in the oven with the door closed for 30 minutes. Do not open the door! After 30 minutes, crack the oven door and leave the cheesecake in the oven for another 20 minutes. Take the cheesecake out of the oven and let it sit at room temperature for 15 minutes, then remove the pan from the water bath and remove the foil. Wrap it with plastic wrap and refrigerate until it's completely cool and firm, 6-7 hours or overnight. Don't remove the springform pan from the cheesecake until it's done chilling and you're ready to assemble. Place apples, brown sugar, lemon juice, cinnamon, and butter in a large saucepan. Cook over medium heat until the apples are tender, about 10-15 minutes. Frost the top of the cheesecake with additional caramel sauce, then spoon the apples over the top. Drizzle additional caramel down the sides of the cheesecake if desired. Refrigerate cheesecake until ready to serve. It's best eaten within 2-3 days but should last 4-5 days. This is beautiful and yes to what you’re saying about being blown away by Lindsay’s cakes. Whenever I see those pins on Pinterest that pop up I know instantly its one of hers because it’s like cake artistry! The not overbeating so as to not create cracks – never knew that! And all the details. Yes. When baking you can never have too many! Oh my my my! This is simply stunning and irresistible! Gorgeous cake and photos! Caramel oozing just never gets old. And all the apple feels right now, love! love love love. This sounds completely amazing! Do you think I can use gluten free wafers for the crust and gluten free flour in the cheesecake layer? Oh Dorothy this cheesecake looks absolutely AMAZING!!!! And I didn’t know that beating the cheesecake too much can make it crack, either! I don’t make nearly enough cheesecakes myself. This dessert is definitely a show stopper! 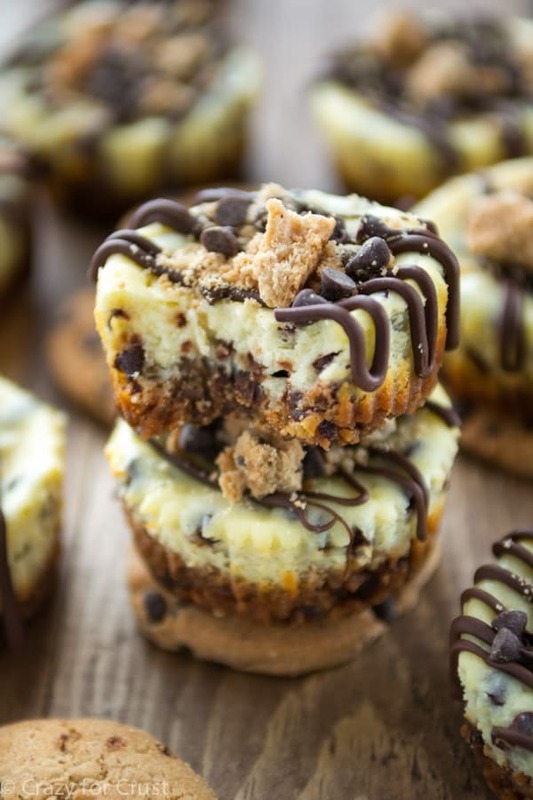 That cheesecake looks awesome, I will make it for Thanksgiving…Maybe even before ? My mom requested a caramel apple cheesecake for her birthday this year and wow!! This was amazing!! I even made your cinnamon caramel recipe and I’m so glad I did instead of buying the premade stuff. I don’t think I’ll buy it ever again!! The only thing I did differently was I made a crust using cinnamon graham crackers instead of vanilla wafers.